You only need to take a brief look at the news to see how the imperialist mindset is still absolutely rife in Britain. 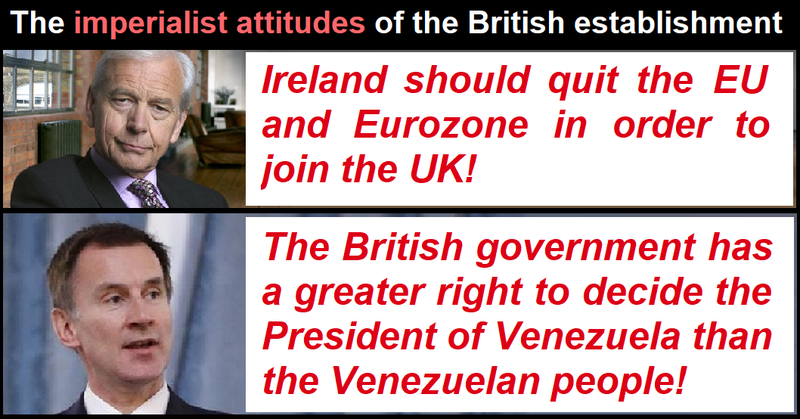 On the one hand we've got Brexiteers telling Ireland that they should quit the European Union and the Euro in order to ally with Brexit Britain, and on the other we've got Tory government ministers confidently asserting that they've got more right to choose who serves as President of Venezuela than the Venezuelan people! Almost a century after the declaration of the Irish Free State you might have imagined that the British establishment might have figured out that the days of Tory toffs in London telling the Irish what to do are well and truly over, yet somehow this imperialist mindset is still rife. 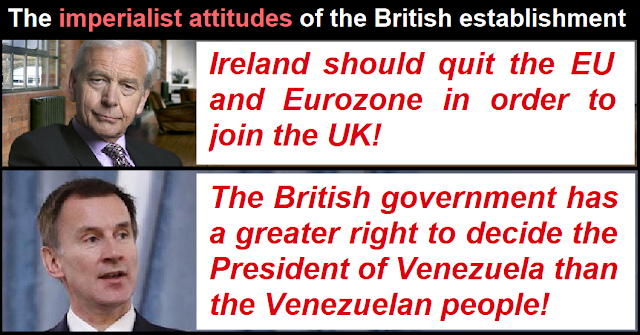 The BBC Today presenter John Humphrys demonstrated this entitled imperialist mindset when he publicly suggested to an Irish government minister that her country could quit the EU and join the UK! However this absurd imperialist attitude towards Ireland is far from exclusive to establishment elites in the media and political classes. Just a few months ago literally hundreds of thousands of pro-Brexit Brits signed a petition calling for the pound to be imposed as legal tender in Ireland whether the Irish want it or not. It's hard to figure out what's more dim-witted, the idea of creating a de facto currency union between the Pound and the Euro, or the idea that the Pound can be forced on the Republic of Ireland by means of petitioning the UK government. Screw the fact that 92% of Irish people oppose quitting the EU, and that an even higher percentage would oppose a return to London-rule, the establishment mentality seems to be that Brexit would go a lot more smoothly if the Irish would just shut up and do as they're told, and a lot of ordinary Brits share this mindset. These imperialist attitudes when it comes to our closest neighbours are shocking enough, but when it comes to Venezuela it's not just insulting Brextremist fantasies of renewed British dominion, deliberate interference is actual government policy. When the British foreign minister Jeremy Hunt feels empowered to recognise coup-plotters who appoint themselves President (despite not having even stood in the 2018 Presidential election at the time) this is a whole other level of arrogance. What gives the UK more right to determine the President of a foreign nation than the people of that nation themselves? There is obviously no legitimate answer to this question, but the imperialist mindset always churns out justifications based on how bad the foreign head of state is, and how removal by outsiders is what's best for the people of that country. We've got two glaring examples of how this imperialist "regime change" mentality has led to unspeakable humanitarian disasters just in recent history. Yes Saddam Hussain and Muammar Gaddafi were authoritarian rulers, but only a madman could attempt to argue that turning Iraq and Libya into vast lawless terrorism breeding grounds full of ISIS training camps and modern day slave markets was either good for the peoples of those countries, or good for the regions as a whole. We've been sold this imperialist turd before, yet here we are again with liberals and self-proclaimed centrists clamouring to align themselves with the hard-right to promote the imperialist "regime change" agenda in Venezuela, and desperately smearing anyone who dares raise questions about the dangers of this imperialist mindset as being nothing more than biased stooges for the latest target regime. If you dared question it in 2003 you were smeared as a Saddam Hussain supporter, and if you question it today you're accused of being a stooge for the corrupt and incompetent Maduro government in Venezuela. The fact that the very same arguments are being wheeled out to support imperialist "regime change" in Venezuela as were used in Iraq in 2003 and Libya in 2011 proves that this imperialist mindset has never really faded away. But imperialism is resurgent again now thanks to factors like Brexit, the mainstreaming of extreme-right jingoism, and the destabilisation of Venezuela in a brazen grab for corporate control of the largest proven oil reserves in the world, but it never fully diminishes in the interim periods between the waves of ultranationalist jingoism. More evidence that this imperialist mindset has never really died down amongst the British can be found in the poll findings that huge swathes of the British public consider the British empire to have been a positive thing! Yes of course there are some periphery positive legacies like the rail networks that British imperialists left behind, but even then the main purpose of those rail networks was to enable the looting of the invaded countries' natural resources in order to enrich the British establishment class. The warm glow of nostalgia over rail networks, colonial buildings, and the political remnants of Commonwealth should surely be outweighed by the centuries of political repression, resource theft, racism, slavery, starvation, and outright genocide. But somehow no! When asked to evaluate the British empire, more Brits will award it an overall positive legacy than admit that the ethical problems might have somewhat outweighed the benefits. So given the massive proportion of Brits who exalt and glorify the age of empire is it any wonder that our establishment class keep embarrassing Britain on the global stage by pushing the same old imperialist nonsense that Britain has somehow got some special right to inflict our political agendas on our closest neighbours and distant peoples alike? When they impotently try to boss the Irish around, promote their post-Brexit trade plans as being "Empire 2.0", and push deadly imperialist "regime change" agendas in places like Iraq, Libya, Syria, and Venezuela, they're actually giving a significant swathe of the British public exactly what they want. If more of us stood up and protested against grotesque displays of ultranationalism and imperialism then perhaps the establishment class would learn to stop doing it, or at least tone it down a few levels. But as it is now the next unbelievably arrogant insult aimed at our closest European neighbours is always just moments away, and the next Iraq-style humanitarian disaster is always looming just over the horizon.